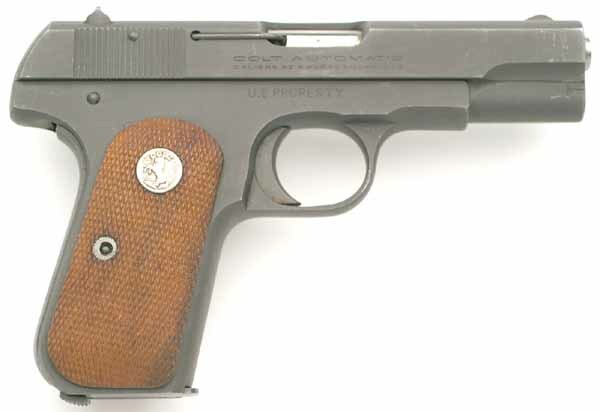 Colt Model M .32 ACP issued to Brigadier General George Robinson Mather (West Point Class of 1932) before 1959. 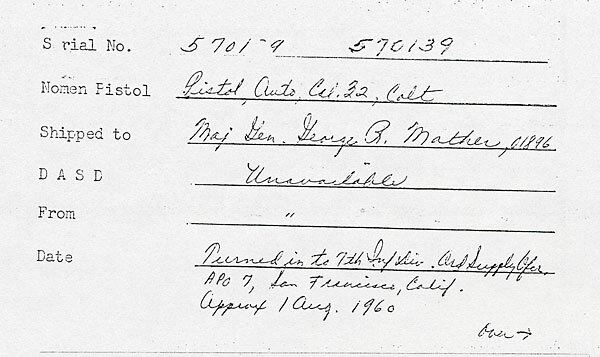 There is a record that this pistol was returned by General Mather in 1960. 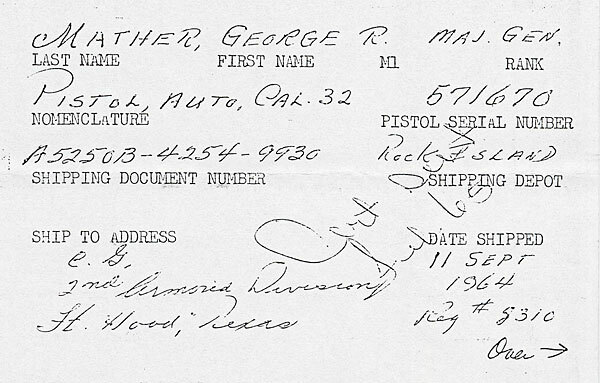 There is also a record of General Mather receiving Colt Model M .32 serial number 571670 on 9/11/1964. The death of General George Robinson Mather, on 1 January 1993 in Southern Pines, North Carolina, is announced with deep regret. His last I duty assignment was as Commander in Chief, United States Southern Command. General Mather was an officer of the highest ideals. His courage, sound judgment, and superb leadership produced brilliant military achievements of the greatest value to his country. With his passing the nation has lost a faithful, valiant servant and the United States Army, a commander of great stature. 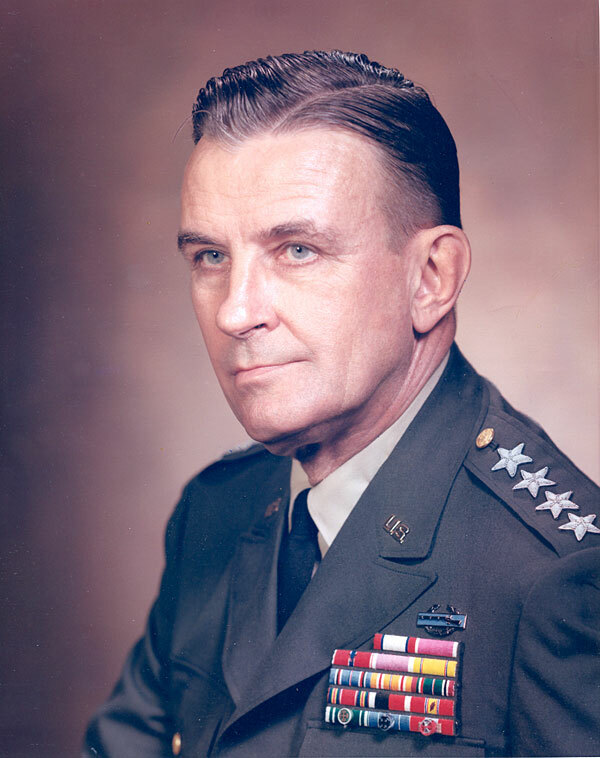 General Mather was born in Watertown, South Dakota on June 2, 1911. He was appointed to the United States Military Academy and in 1932 he graduated and was commissioned a 2nd Lieutenant in the Calvary. General Mather commanded every type of tactical organization from cavalry platoon to armored division to Army Corps. He studied Spanish at the University of Mexico in 1937 and then taught Spanish at the U.S. Military Academy for four years. 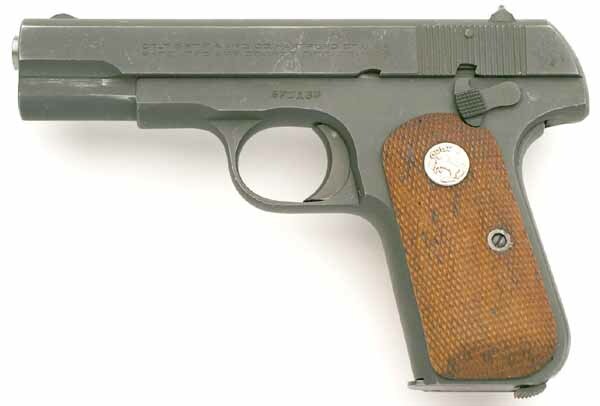 During World War II, he served as Executive Officer of the 110th Infantry Regiment of the 28th Infantry Division. From 1946 to 1948, General Mather served on the Staff of the Caribbean Command in the Panama Canal Zone. This began a lengthy association with Latin American countries. Following an assignment as Chief of Staff, Fourth United States Army, Fort Sam Houston, Texas in 1961, he was assigned as Chairman, United States Delegation, Joint Brazil-United States Military Assistance Advisory Group in Rio de Janeiro, Brazil until September 1964. In 1965 he assumed command of the 2d Armored Division, Fort Hood, Texas. Following that assignment, he served as the United States Military Representative to the Permanent Military Deputies Group, Central Treaty Organization, Europe, located in Ankara, Turkey. General Mather became the Commanding General of V Corps, United States Army Europe in 1966 and served there until 1967. He then returned to Fort Hood, Texas to assume command of III Corps, until 1968. In July of 1968, he became the first Director of Civil Disturbance Planning and Operations, Office of the Chief of Staff, Washington, DC. His last assignment marked a return to the Panama Canal Zone where he was the Commander in Chief, United States Southern Command. 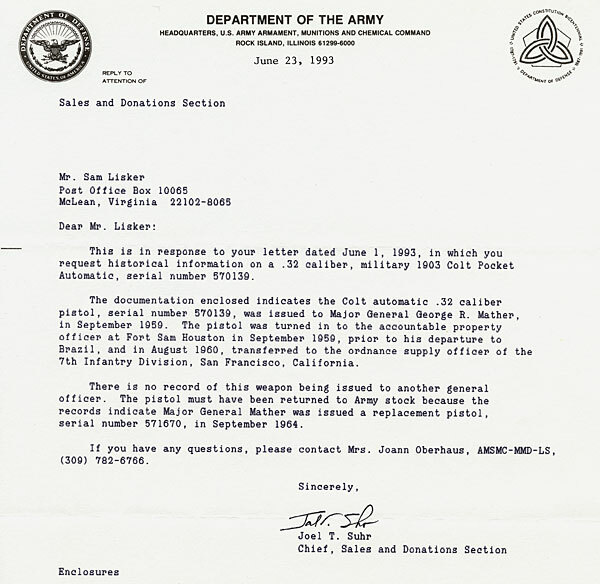 General Mather retired from active duty in 1971 after 38 years of service to the nation. He remained active in his community after retirement and served two terms as a member of the Pinehurst Village Council. For his exceptionally meritorious and distinguished service, General Mather's awards and decorations include the Distinguished Service Medal with oak leaf cluster; the Legion of Merit; the Bronze Star Medal with "V" Device; the Purple Heart; and the Combat Infantryman Badge. General Mather's life was characterized by courage, dedication, vision, and patriotism. These qualities earned him the respect of all who knew him. The grief caused by the death of General Mather is deeply shared by all members of the United States Army. 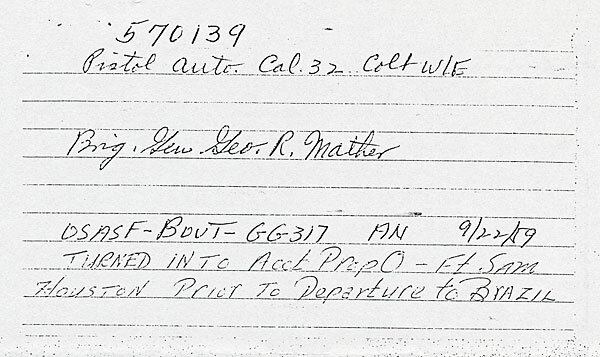 General Mather is survived by his son, Dr. George R. Mather, Jr. of Toledo, Ohio, and a daughter Kathleen M. Bulgin of Greensboro, North Carolina. Active Army, Army National Guard, US. Army Reserve: To be distributed in accordance with DA Form 12-04-E (block 0037, requirements for Department of the Army General Orders. Born, 2 June 1911 South Dakota and admitted to West Point in 1928 from same state, Cavalry. In December of 1944 the 110th played a significant role at the Battle of the Bulge. More than 2,700 men were lost in three days of fighting but the 110th fought on and took a heavy toll upon the enemy. Same as the insignia of all U.S. Armored Divisions. It is the shape of an equilateral triangle, divided into three segments, each a different color. The Blue segment represents the Infantry components of the Division: Scarlet, the Artillery, and Yellow, the Cavalry. The tank track and cannon in black, topped by a red lighting shaft are symbolic of armored "blitz" warfare. The black Arabic "2" in the upper yellow segment of the triangle indicates the number of the division. The division's nickname, " Hell on Wheels" in yellow block letters against an olive background.